There were times in the first few days where I looked at my perfect dog and thought yes, life would be so much easier right now without you. And then I thought, your life was so much better last week. How could I have done this to you? And it would have been easy to think that for her sake, I should find her a shiny new better home. Easy to think that the kindest option would be to send my best friend away to live with strangers who didn’t have small dependents sucking up 95% of their time. But I love this dog and I’ve always said that if anybody needs to be rehomed, healthy white newborns probably have a much better chance of finding a good home than scruffy middle-aged mongrels, even if the mongrel does have good training and a heart of gold. So we persevered. And it hasn’t been that bad! I was worried that she would struggle to share us with the babies, that we would have jealousy issues to work through, but there’s been none of that. She can be a trifle clumsy and clueless and there have been a few hair-raising moments (like when she tried to leap up on the bed without realising that the twins were already laying on it!) but those have all been our fault rather than hers. We try to be careful to safeguard all of them by never leaving her alone with the babies, or putting her in a position where she could accidentally harm them. Actually, consistent help with the dog would have made an enormous difference to our sanity levels in this first week and a half. My mother kindly agreed to look after her for the birth and then rather begrudgingly took her when we were readmitted, but my family are not the sort to pop round to take Josephine for a walk. It would have taken a massive weight off if, for example, we hadn’t had to worry about making time to walk the dog in the morning amidst the chaos of having to dress, change and feed two babies, plus use the breastpump, plus dress ourselves. I’ll admit that I haven’t yet managed a morning walk with brushed hair! Kirsty’s family adore the dog and I suspect would have been happy to help but alas, they are on the other side of London. I had hoped that we would have the budget to employ a dog walker to be her friend for an hour or so each day, but ultimately it was not to be. Thankfully, I had the easiest caesarean recovery ever and the twins adore their pram, so we have been able to take lots of lovely long walks at strange hours. We’re finding that the more worn out she is, the easier it is for the rest of us. My batty post-partum hormones can’t cope with seeing a bored and moping dog on my sofa! Establishing a routine has been our saving grace as it gives us – and her – some idea of when we need to start getting ready, and a target time to get out of the door. That said, we have also tried to introduce little treats and highlights back into her day, whether it’s sharing a slice of toast with us whilst the babies are sleeping or a quick game of kisses whilst I’m feeding a baby. It’s hard to remember to prioritise the dog over ourselves when we finally have a minute and all that we really want to do is snuggle and sleep, but it makes such a difference to her day and to ours if we find time to remember her feelings. After all, she’s been our ‘baby’ for so long. The only issue that we’re experiencing is that she’s very protective of the babies. She doesn’t like for anybody aside from us, but especially men, to hold them. It’s something to work on, and we’ll get a behaviourist in if necessary, but as far as adjustment behaviours go this one isn’t too hard to deal with. 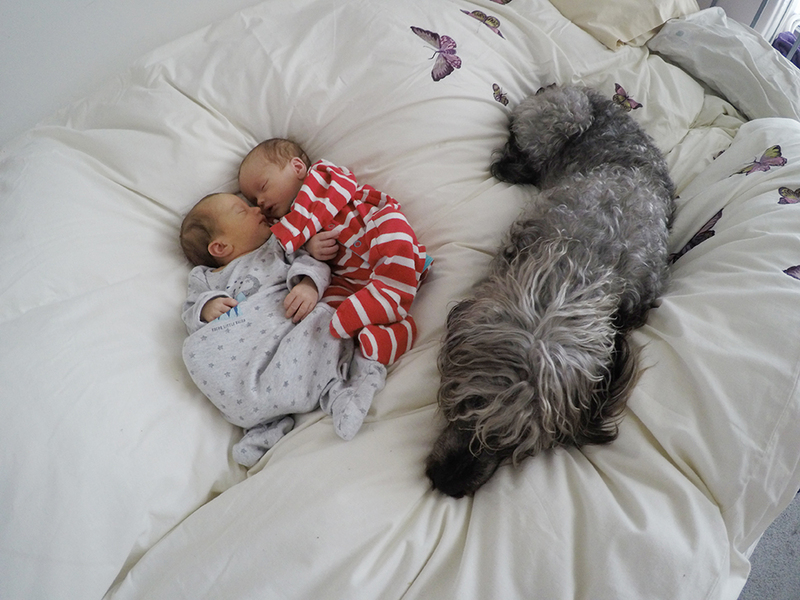 I think that this dog-and-two-babies family thing is actually going to work. I’m feeling pretty positive right now. Exhausted, admittedly, but full of happiness that with a little bit of extra effort and a lot of good behaviour on Josephine’s part, we can do this thing. It sounds like you are doing a beautiful job! 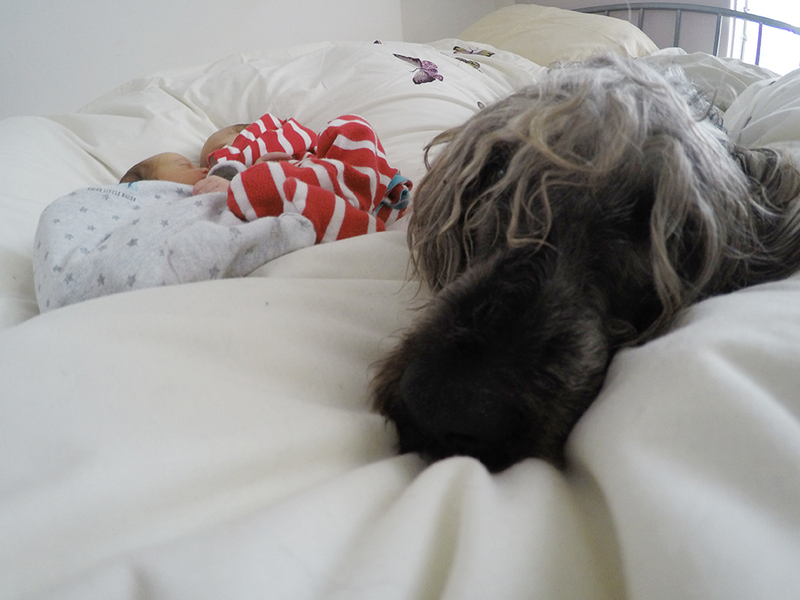 It isn’t easy adjusting to life with a new baby (I’m sure 2 is much trickier.) Does Posey normally like men? Perhaps if the person can give her treats and attention before interacting with the babies, she’ll feel better about him. I wish she could come over here for an afternoon!